Residential temperature controls have the big job of keeping your Portland-area home comfortable by controlling indoor temperatures. By knowing what to look for in a programmable thermostat and how to use it correctly, you’ll save money and your HVAC system will work more efficiently. Compatibility: One of the best ways to save money when buying a new thermostat is to look for one that’s compatible with your HVAC system. Otherwise, the device might not work well or cause undue wear and tear on equipment. Know your abilities: Today’s offers programmable thermostats and smart thermostats. If you’re tech-savvy, the extra expense that comes with smart thermostats and high-end models might be worth the convenience. Otherwise, you might be better off with a simpler, less expensive model. Ease of use: Look for a model that’s doesn’t require a big learning curve to use so you can take advantage of its features immediately. Know your current thermostat’s wiring: Older thermostats typically use a couple low-voltage wires. Newer models often require a common wire, or C-wire, that provides continuous power. Knowing the wiring in your home will help you narrow down your choices. Know your schedule: Do you need a different temperature schedule for every day of the week or a different schedule for weekdays and the weekend? Knowing this will help you find a model that maximizes your system’s efficiency while meeting your comfort needs. 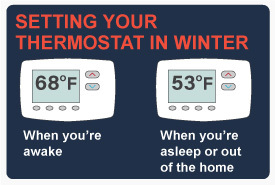 During the winter, set your thermostat no higher than 68°F when you’re awake. Set the temperature up to 15°F lower for when you’re asleep or out of the home. 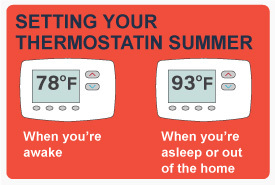 During the summer, set the thermostat no lower than 78°F for when you’re awake. Set the temperature up to 15°F higher for when you’re asleep or out of the home. How do you program a programmable thermostat? When you don’t know how to set a thermostat, let the device’s display guide you. Modern models are user-friendly and will walk you through the process when you press “Schedule,” “Set,” “Settings,” “Program,” or “Menu,” depending on the model you own. My house has a thermostat but some areas of my house feel uncomfortable. What can I do? Consider setting up a residential zoning system. The setup provides you with more than one thermostat, giving you more control over the temperature in different areas of your house. Will cranking up the heat make my house warm up quickly? No. The same is true for turning the temperature to the lowest setting. Don’t believe this myth. HVAC systems heat and cool at a uniform rate. Is the thermostat broken if the temperature displayed isn’t correct? Not necessarily. A variety of factors might be to blame, such as dust within the thermostat, needing to recalibrate the device, incorrect fan settings, leaky ductwork or an issue with the HVAC system. AAA Heating and Cooling is dedicated to your home comfort. Contact us today for expert help with finding the right thermostat for your home.